The making of my book: "Venice on the edge of light"
Inspired as a student of photography by one of my mentors, the Magnum photographer David Alan Harvey, I started to walk around Venice with my camera in the hand fifteen years ago. Yes using light as language, following this trial in the narrow streets of Venice, meeting eyes, voices, stories and mysteries hidden behind the scraped walls. I have listened to many legends and shared many secrets. There will always be these memories inside me. All these years spent walking around Venice have given birth to my first published book: “Venice on the edge of light”. Many years, and many books later, these walks have given birth to my Photo Tours in Venice, in which the imperative is to propose only authentic experiences, true stories, and the amazement of a particular light. I really like the type of photography that doesn’t require something special going on, in other words I find the specialness in the everyday event. Here you can find a selection of these pictures taken, like the title says: “on the edge of light”. I remember I especially picked up the public boat from Venice as far as the island of Burano, knowing that there would be a great light on the lagoon while coming back. It was exactly as I expected it to be. It was a very hot late afternoon in August, and I remember that this boat was the only one that passed through this canal while I stopped there. Probably the venetians preferred to stay on the beaches at the Lido, on that day. I shot in digital with a 105mm tele-lens. This is one of my favorite districts in Venice: Castello. Here you can still find people doing their everyday's life, in the streets or beyond an open door, especially in the hot days of Summer. I waited for this woman (yes, she is a woman!) and I exposed for highlights, because I knew that in such a situation the black shape would work for me. The slide film Velvia 50 did the rest. It often happens even to me to discover some new places in Venice I've never seen before. This is such the case: wandering around the district of Castello, I never went as far as the end of this street, which end in the canal. A new, different view of the imposing walls of the Arsenal. 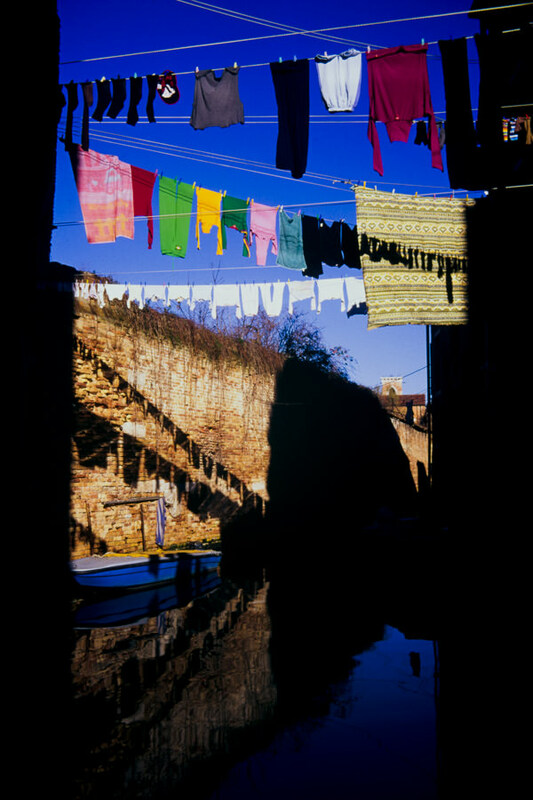 I know that the picture seems a bit over-saturated, but I can assure you that is the result of the slide film Velvia 50 in such a strong light. On October 22nd 1630, the Senate decreed that in order to give thanks for the liberation of Venice from a virulent plague, they would build a great church to be dedicated to the Virgin. Every year, on the 21st November, the feast of Madonna della Salute, Venetians overcrowd the Basilica, to light a candle. When I was a student of photography I learned by heart the books of the great American photographer Ansel Adams (by the way, I had the great honor to do a Photo Tour in Venice with his assistant, now famous photographer, John Sexton), because I was eager to know everything about the technique. One of his pictures that most impressed me was "Moonrise, Hernandez, New Mexico", and "The Moon and Half Dome" too, so when I saw the Moon rising from behind the Basilica of San Marco I could not resist. I shot in digital used a 200mm tele-lens.